LaPorte High School’s 2018 fall play “Our Town” debuted on Friday, October 26th. Three shows, occurring on Friday, Saturday, and Sunday, were presented in the new Performing Arts Center at LPHS. “The play is about a small town set back in the late 1800s/ early 1900s, and it followed the life of two families,” Emerson Easton, senior lead actress, said. The play is divided into three acts: Daily Life, Love and Marriage, and Death. The story behind the play is about appreciating what you have while you have it. Cast members rehearsed every Tuesday and Thursday and occasionally met on Wednesdays. With a motivating cast and an encouraging director, the show was a definite success. “I think that every cast member really tried to improve and were all very self motivated and willing to take advice. This was a very determined cast,” Alaura Shuble, senior actress, said. According to director and English teacher Lindsey Baugh, the actors were not afraid to escape their comfort zones with a serious show that required them to invest emotionally in their characters. “They [cast members] were open to any suggestions that I made for their characters and constantly changed for the better as we moved forward in the rehearsal process,” Baugh said. 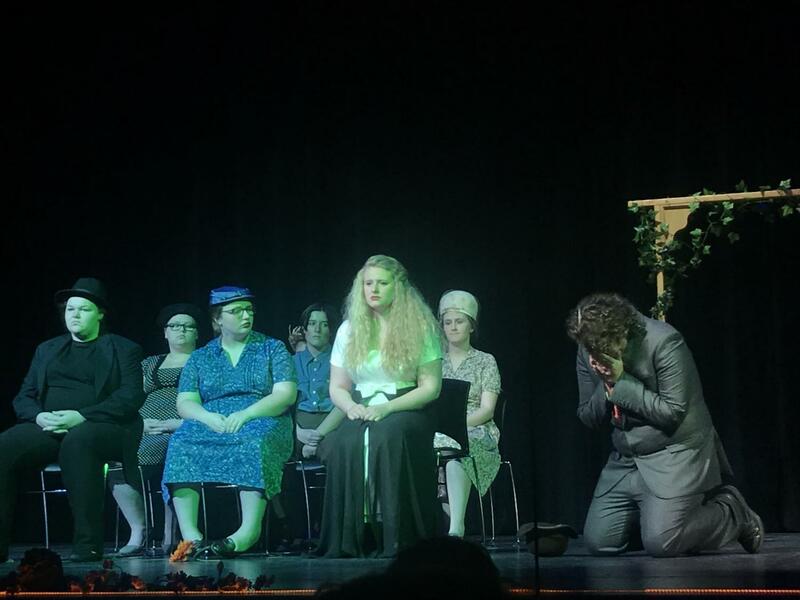 Overall, the 2018 Fall Play was a success. “These students pulled it off magnificently and truly touched the hearts of their audience,” Baugh said.